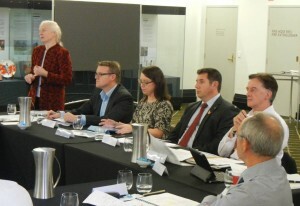 On 13 August 2013, battery stakeholders and government representatives met in Brisbane to discuss the development of a national battery product stewardship scheme for Australia. The Queensland Department of Environment and Heritage Protection (EHP), a GlobalPSC member, is the lead jurisdiction on batteries for Australia’s governments. effectiveness of the program in addressing the public policy and business case considerations. After opening comments and discussions with The Hon. Andrew Powell, Queensland’s Minister for Environment and Heritage Protection, attendees were split into four groups to discuss each question separately. The groups then reported back and their responses were compiled. A summary of the workshop has been posted on the Knowledge Base available to GlobalPSC Members. The GlobalPSC and its members have been active in the program’s development. GlobalPSC Foundation Members MS2 led the development of the business and public policy case for battery stewardship on behalf of Australia’s Victorian Government. The report was circulated to attendees in advance of the workshop. GlobalPSC CEO Russ Martin, who was recently appointed as the independent chair of Australia’s Battery Implementation Working Group, facilitated the workshop. The GlobalPSC also facilitated earlier discussions on battery product stewardship with one of our longest-standing government members, Sustainability Victoria, and the Australian Battery Recycling Initiative.